(Bloomberg) -- Carnival Corp. shares tumbled as much as 7.7 percent, their worst rout of the year, after the cruise line cut its forecast. Earnings are now expected to top out at $4.55 a share this year, excluding some items, Carnival said on Tuesday. It previously put the upper limit at $4.80, and analysts projected $4.76. 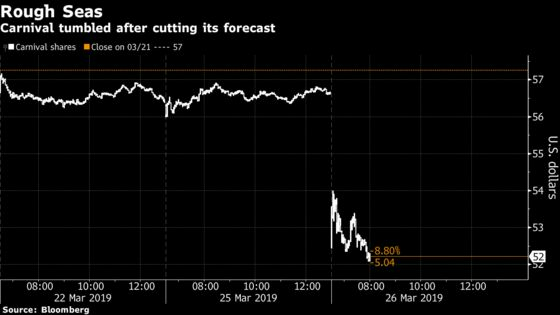 Fuel costs and currency fluctuations are weighing on the world’s largest cruise operator, cutting 22 cents a share from its annual forecast. That’s overshadowed the company’s fairly strong bookings and a push into Asia. The shares fell as low as $52.28 in the biggest intraday decline since Dec. 20. Before the plunge, Carnival had been up 15 percent this year.